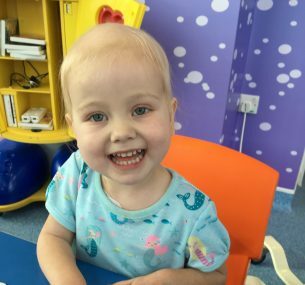 My daughter Chloe (aged 2) was diagnosed with B Cell Leukaemia (ALL) at the end of September 2018. Chloe’s diagnosis was completely out of the blue; she developed a rash over the course of 24 hours mainly on her feet and stomach so I thought it would be best to get it looked at by our GP. Expecting the GP to say it was viral, my heart started racing when she requested we attend the Bristol Children’s hospital that evening. Within two hours the blood work was done and the A&E consultant advised that myself and my husband prepare ourselves as the chances of leukaemia were extremely high. Over the course of the weekend various tests were done with confirmation on the 24th September 2018 that Chloe had ALL. For days I woke up thinking it was just a terrible nightmare then, as the days went by, it became more real and I kept thinking “Why me, why us and why our little girl”! The consultants were extremely informative and gave us a lot of information about the treatment plan, but nothing quite prepares you for this nightmare. The thought of my beautiful girl losing all her hair was heartbreaking. The steroids made Chloe extremely hungry and short tempered and she would often not want to be around anyone other than mummy and daddy! Initially Chloe was in hospital for 12 days. We are lucky to live about 45 mins from the hospital. The induction phase of treatment was extremely traumatic involving steroids and a number of drugs that had nasty side effects such as constipation. Sadly, Chloe’s bowel perforated on day 30 which required a four hour surgical procedure and a three week recovery period, delaying the ever important chemotherapy. It was a terribly traumatic 24 hours, placing your daughter’s life in somebody else’s hands was frightening. You can’t help but think the worst. The surgeon advised that it would not be entirely clear until she went to theatre. At last, just before midnight the surgeon appeared giving the news we needed to hear that her operation had been successful. More good news followed after her surgery that the treatment she underwent in the induction phase was successful and remission had been achieved!! 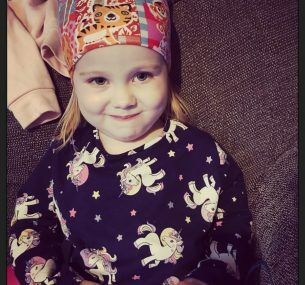 She recovered well from her operation and was able to get going with the next phase of treatment at the end of November. Chloe’s diagnosis has affected so many people; from family to friends to colleagues! It was such a shock to everyone who has a connection of some kind to Chloe. For our parents seeing their granddaughter so poorly has been horrific, as well as watching their own children deal with the heartache. Chloe has a five year old sister called Imogen. 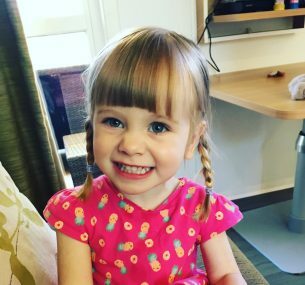 Imogen had just started school when Chloe was diagnosed so balancing her emotions and explaining to her about Chloe’s diagnosis was extremely challenging. Imogen has taken it all in her stride and has been doing so well at school. We are extremely proud of her for being such an amazing big sister to Chloe. 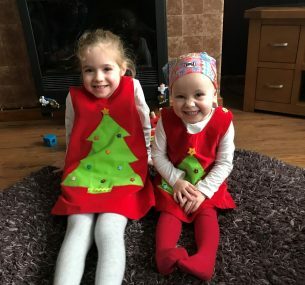 Time apart from Chloe was hard for her and she even told her class in January her favourite Christmas present was having her sister at home!! The support we have received throughout this journey so far has been extremely overwhelming. Our immediate family of parents and siblings has been amazing! Having help and support for Imogen was extremely comforting and we never had to worry about school runs. They wiped our tears and listened when we needed to talk. Close friends were there at the end of a phone offering to help with childcare and lifts to the hospital. Chloe is doing well and currently in the delayed intensification phase. She has three weeks left before beginning maintenance. Her treatment is scheduled to be completed in December 2020. We’ve had to make a number of really huge decisions and in particular regarding Chloe’s treatment route. We decided to take part in the clinical trial. The surgical team also asked to use Chloe’s surgical procedure notes including the medical photography in further teaching. They are also going to be publishing an article in the Journal of Paediatric Surgery. I hope that Chloe’s bowel surgery notes will help the surgical team to reduce this happening to other children. I am writing this story to raise awareness for childhood cancer and hope it may help other parents who are starting this journey. Although Chloe’s initial phase was not forecasted, you can get through difficult phases. Sometimes it’s about taking it a day at a time and some days an hour at a time! !